There hasn’t been a dual-sport Ducati bike since the Scrambler of 1961-74. 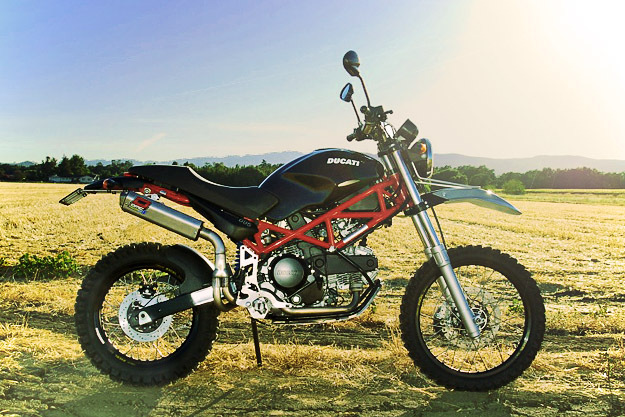 But Overland Motorcycles of California has revived the tradition with its stylish Terra Mostro—“Dirt Monster”—based on the stock Ducati 695 Monster. The biggest mods are a longer swingarm, long-travel suspension, and heavy-duty Excel Takasago rims. Engine power goes up, but gearing is lowered to suit on- and off-road antics. The cost? $16,590.